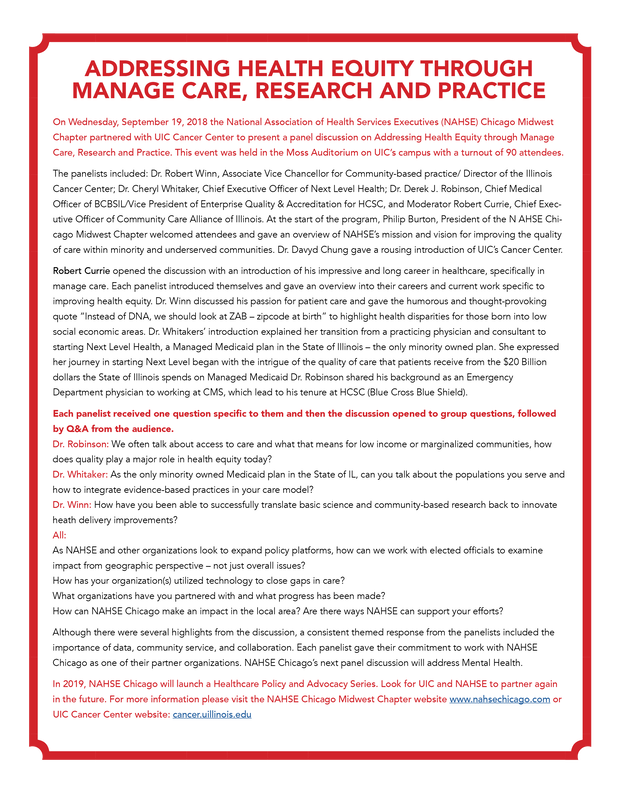 On Wednesday, September 19, 2018 the National Association of Health Services Executives (NAHSE) Chicago Midwest Chapter partnered with UIC Cancer Center to present a panel discussion on Addressing Health Equity through Manage Care, Research and Practice. 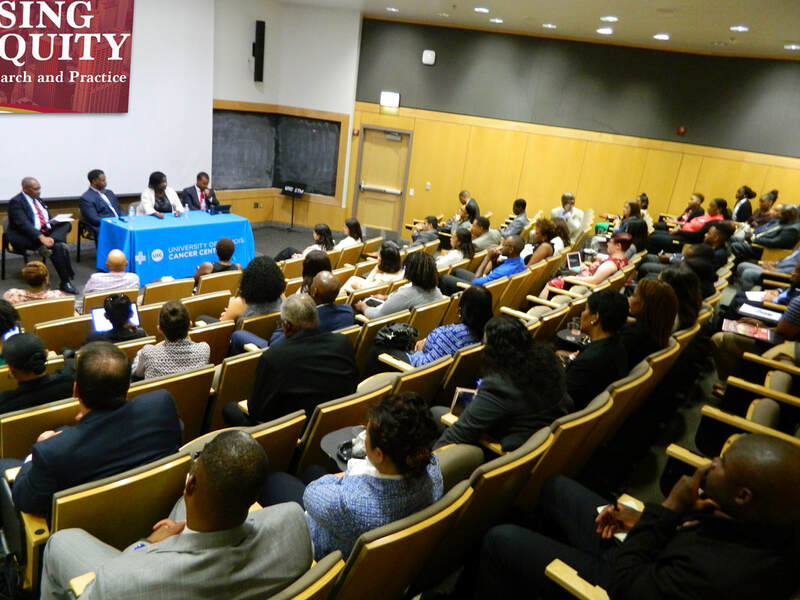 This event was held in the Moss Auditorium on UIC’s campus with a turnout of 90 attendees. Officer of BCBSIL/Vice President of Enterprise Quality & Accreditation for HCSC, and Moderator Robert Currie, Chief Executive Officer of Community Care Alliance of Illinois. At the start of the program, Philip Burton, President of the NAHSE Chicago Midwest Chapter welcomed attendees and gave an overview of NAHSE’s mission and vision for improving the quality of care within minority and underserved communities. Dr. Davyd Chung gave a rousing introduction of UIC’s Cancer Center. Robert Currie opened the discussion with an introduction of his impressive and long career in healthcare, specifically in manage care. Each panelist introduced themselves and gave an overview into their careers and current work specific to improving health equity. Dr. Winn discussed his passion for patient care and gave the humorous and thought-provoking quote “Instead of DNA, we should look at ZAB – zipcode at birth” to highlight health disparities for those born into low social economic areas. Dr. Whitakers’ introduction explained her transition from a practicing physician and consultant to starting Next Level Health, a Managed Medicaid plan in the State of Illinois – the only minority owned plan. She expressed her journey in starting Next Level began with the intrigue of the quality of care that patients receive from the $20 Billion dollars the State of Illinois spends on Managed Medicaid. Dr. Robinson shared his background as an Emergency Department physician to working at CMS, which lead to his tenure at HCSC (Blue Cross Blue Shield). Each panelist received one question specific to them and then the discussion opened to group questions, followed by Q&A from the audience. Dr. Robinson: We often talk about access to care and what that means for low income or marginalized communities, how does quality play a major role in health equity today? Dr. Whitaker: As the only minority owned Medicaid plan in the State of IL, can you talk about the populations you serve and how to integrate evidence-based practices in your care model? Dr. Winn: How have you been able to successfully translate basic science and community-based research back to innovate heath delivery improvements? All: As NAHSE and other organizations look to expand policy platforms, how can we work with elected officials to examine impact from geographic perspective – not just overall issues? How has your organization(s) utilized technology to close gaps in care? What organizations have you partnered with and what progress has been made? How can NAHSE Chicago make an impact in the local area? Are there ways NAHSE can support your efforts? Chicago as one of their partner organizations. NAHSE Chicago’s next panel discussion will address Mental Health.